Get an in-depth understanding of the dental materials and tasks that dental professionals encounter every day with Dental Materials: Foundations and Applications. 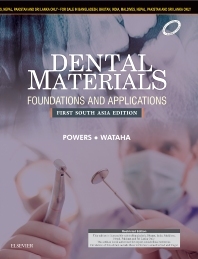 Trusted for nearly 40 years, Powers and Wataha’s text walks readers through the nature, categories, and uses of clinical and laboratory dental materials in use today. Increased coverage of foundational basics and clinical applications and an expanded art program help make complex content easier to grasp. If you’re looking to effectively stay on top of the rapidly developing field of dental materials, look no further than this proven text. Key terms are set in boldface at their initial mention in the text and defined in the glossary. Conversion Factors, given in the end (after Index), provides a list of common metric conversions.